Indo-German research cruise sets sail despite criticism. A German research ship laden with 20 tonnes of iron sulphate has whipped up a storm of protest as it sails towards the Antarctic, where it intends to dump its cargo into the ocean. Scientists on the Polarstern, which set sail from Cape Town in South Africa on 7 January, plan an ocean fertilization experiment that some argue will violate international law. But the scientists say that it will yield the very data necessary to assess the impact of the controversial geo-engineering technique, which aims to trap carbon dioxide from the atmosphere by encouraging the growth of algae. The team, comprising about 50 scientists from Germany, India, Italy, Spain, Chile, France and Britain, is heading for a small patch of the Scotia Sea between Argentina and the Antarctic Peninsula. The researchers hope that the iron will induce an algal bloom in this usually nutrient-poor region, and plan to observe the growth and decay of the organisms in unprecedented detail during the following eight weeks. The experiment is called LOHAFEX, taking its name from loha, the Hindi word for iron. It will be the sixth ocean fertilization study conducted in the Southern Ocean since 1993. Previous experiments, such as the European Iron Fertilization Experiment (EIFEX) carried out in 2004, indicated that iron fertilization could help to send more carbon-based materials down to the deep ocean. If applied across the Southern Ocean, it is estimated that ocean fertilization could remove up to a billion tonnes of carbon from the atmosphere every year1. This could, in theory, help to mitigate global warming; but as the effects on marine ecosystems and biodiversity are uncertain, most experts hold that large-scale ocean fertilization is currently not scientifically justified. In response to wide-spread environmental concerns, the 191 parties to the United Nation’s Convention on Biological Diversity last year agreed on a moratorium on all ocean fertilization activities, including attempts at commercializing iron fertilization. Several companies in the United States and Australia have planned to sequester carbon in this way, which could then be sold as offsets on carbon credit markets. The body recommended that until a “global, transparent and effective control and regulatory mechanism is in place for these activities”, only small-scale scientific studies in coastal waters should be exempted. Environmental campaigners say that LOHAFEX should not have received permission under these rules. The 300-square-kilometre experiment is neither small-scale, nor confined to coastal waters, they argue. Mayet had unsuccessfully called on the South African ministry for environment to ask the Polarstern crew to unload its iron sulphate, or otherwise stop the ship from leaving the port of Cape Town. 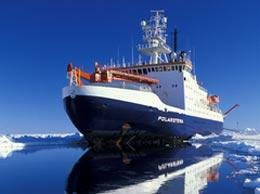 But the Alfred Wegener Institute for Polar and Marine Research (AWI) in Bremerhaven, Germany, which operates the Polarstern, denies that the experiment falls under the United Nations moratorium. The new study will address, among other things, marine biology, the flow of carbonaceous particles, and biodiversity questions that have barely been analysed during previous experiments, says Karin Lochte, the director of the AWI. “These are exactly the kind of data you need to assess whether or not large-scale ocean fertilization is justified,” she says. The experiment will take place near the island of South Georgia, its precise location depending on weather conditions and the location of ocean eddies, Lochte says. The German ministry of the environment has been informed about the experiment and has not raised any objections, she adds. The government of India, which is co-funding the cruise, has also been informed and has approved the experiment. At a workshop held last year at the Woods Hole Oceanographic Institution in Massachusetts, marine policy experts estimated the potential value of ocean fertilization at up to US$100 billion of the emerging international carbon-trading market. But ocean fertilization projects are not yet approved under any carbon credit regulatory scheme. Victor Smetacek, a biological oceanographer at AWI and co-chief scientist of the cruise, says that the experiment is not intended to pave the ground for commercial projects. “In view of the ongoing controversy regarding future ocean iron fertilization activities,” he says, “we need to distinguish legitimate scientific experiments such as ours from publicity stunt attempts at commercializing iron fertilization for the carbon credit market.” The team expects to reach the experiment site within the next few days.